Back on March 27, I stated here that there would be no funding for the Yonge Subway extension to Richmond Hill. Today’s issue of the Richmond Hill Liberal has a story that starts on the front page about how this project has had its brakes slammed on because of lack of funding. Hopefully, this will give the chance to reconsider how best to serve York Region by looking at LRT as a viable option that can meet the needs of the Yonge corridor and at the same time reach a far greater area, and people, for the same money. If this does not show the “Wow! Once we have our train the world will be wonderful” attitude, then tell me what does. Does he not realize that a system that is bursting at its seams in its core cannot simply be extended further and further out and expect to attract more people. Does Fisch think that the system will magically just handle more? The TTC has received funding to upgrade its signalling system. This is needed over the next few years because the current system is getting harder to repair, but this has been cited as being the panacea to increase capacity by decreasing head-ways. This will increase capacity, but not by as much as one might expect. Current rush hour head-ways are about 150 seconds and it is said that the new signalling system can bring that down to 90, for a capacity increase of about 66%. The trouble with that is, that leaves no room for any minor delay (think of that guy who grabs the door because he just has to get on this train). Minor delays of even 15 seconds will drastically effect the entire line’s operation. Let’s say to account for such problems, the headway can be brought down to 115 seconds. That gives us an increase in capacity of 29%. One problem with that: terminals such as Finch and Downsview require close to 140 seconds to turn a train around. The way around this is to short-turn trains, but that means that the ends of the line will not be used for its full capacity, even though it costs just as much. Markham Mayor Frank Scarpitti said he understood the approval (of the funding for the signalling upgrade) would lead to a green light for the subway, but now wondered if that money could have been better spent elsewhere. News to Frank: this upgrade is needed without the extension. The new Toronto Rocket subway trains, that will begin to operate later this year, will add about 3% to the capacity of the line. This is mostly due to the space between each car that may be occupied by passengers, but it is partly due to the ability for passengers to spread out throughout the entire train. There is a possibility, though not funded yet, of adding a 50-foot trailer car to the middle of a train to add some more capacity. This would add another 11% capacity. Capacity of the trains themselves is not the whole issue. Can the stations downtown receive a significant increase of people arriving on trains? The simple answer is ‘no’. The Bloor-Yonge station alone is bursting at its seams. The TTC has plans of renovating this station to increase passenger flow and capacity, but this may not be enough. Worse yet, some parts of those plans may not be physically possible as the north end of the Yonge line platform sits within the foundation posts of the Hudson’s Bay tower. Many of the other stations lack a second exit as required by current fire code. Imagine an emergency need to evacuate with 20% more people on the system? Imagine it now! This entry was posted on Thursday, June 25th, 2009 at 2:02 pm	under York Region, General Transit, Subway Expansion. What may be of interest, the first automatic passenger railway in the world, London’s Victoria Line (though still retaining drivers), was originally signaled for 90 second headways. Minor delays, as you mentioned above and station overcrowding means that the Victoria Line runs at 2 minute headways today, in peak hours. A brief scan of other major metro systems also sees the 2 minute headways are the norm. Of course light metro’s like VAL and SkyTrain, because of their smaller size and capacities can run at 60 second headways and LRT/tram can happily operate at 30 second headways during peak hours. In Karlsruhe (Germany) today, coupled sets of trams (480 capacity) operate at 45 second headways through the city during the evening peak! Cal’s comment: It goes to show that short headways are not directly related to automated systems. The current signalling system on the TTC subway is a fixed block system with trip-arm protection. This means that a train cannot enter a block until that block and the one beyond it are clear of another train. The borders between blocks are fixed with a signal and trip arm guarding its entry and trains cannot close in any closer than two blocks under normal operating procedures. Many automated signalling systems, such as the Scarborough RT, use a moving block system where the safety zone moves with the train. LRT/tram operations for the most part use line of sight, so the operator may close in as tight as necessary and as safely as possible, so head ways may be quite close. If you take a look at my page on Melbourne, the section on Melbourne University mentions that during rush hours trams arrive more often than every 60 seconds. The trouble with automatic signaling is the intense maintenance needed to keep thing in order and when the signaling system ages, faults occur causing delay and when operating close headways, even a 5 minute delay causes much serve headaches. In Vancouver, our SkyTrain ICTS/ALRT/ART is almost 25 years old and delays due to aging signaling are now common place. 3 minutes here, 5 minutes there, they all add up. I would wager that the dreadful accident in Washington was caused by faulty signaling due to age; lack of maintenance and not aging cars. GO might not be the be-all, end-all solution but it certainly won’t cost us an arm and a leg to implement better quality service along a PREEXISTING transit corridor. To extend YUS to to Richmond Hill is already escalating up into the $5 billion dollar mark for a measly 6kms of new track, and considering the type of land usage en route, I question whether it is even necessary. People keep hyping up the Yonge and Clark intersection as justification for it but to me there is no more impressive than about five dozen or so other high-rise clusters region-wide that aren’t on any type of radar to get new subways. It boogles the mind as to why we always must go to the most expensive option for areas of lower density (Thornhill, Sheppard through Willowdale) yet a corridor which already has on average 150,000 transit users a day (Eglinton) will be ill-fated with a mixed-traffic road median LRT line. Cal’s comment: It boggles my mind why so many stations are in this proposal. Talk about most expensive option. I am in favour of extending it to Steeles, but with only that one station added. - Electify the exclusively GO owned and operated Bala Sub to allot 5-min headways of train service to Richmond Hill, Langstaff and even a new infill stop around John/Bayview. Remember each train carries 1800 seated passengers; 6-car T1s carry about 1000. Note also, its only every second subway train that’ll head north of Finch Stn meaning customers at RHC would have to wait every five minutes regardless for rapid transit into Toronto. GO really should be the preferred way to commute for the types of trips between 905 regions and downtown. Also, it should be more useful for trips that do not go to Union (read: some additional stops with easy transfer to other transit should be added) and should also be the preferred part of intra-416 transit that is longer distance. Let me clarify one thing, though: GO does not own and operate any part of the Bala Sub. CN still owns this, and while the bulk of their own activity is north of Doncaster, I have seen fairly recently freight activity south of there. In addition to this, the Northlander uses the Bala Sub, and VIA’s Canadian uses it, though only in one direction south of Doncaster. - Extend the subway only to Steeles Avenue. The simplicity of the alignment to this point means costs can be kept low ($750 million tops). Forget about the elaborate underground bus terminal that threatens to expropriate homes and businesses closeby and just utilize the vacant SW corner at Yonge/Steeles. Centrepoint can always deck over the rest of its parking lot to create new above-grade parking facilities if warranted. Not a bad idea. There will have to still be some bus connections there, but something under the Centrepoint parking lot might be quite a bit less expensive. Certainly the number of bays could be one quarter of what is proposed. - Interline the Sheppard Subway onto the YUS Subway. I know Steve has issue with this but if the line will never be extended out then why have it continue to be a white elephant? So for someone whose trip originates from RHC/Langstaff GO destined for points directly along the Yonge Street corridor, only a single transfer at Oriole/Leslie is required. I won’t go into the technical issues that would make interlining Sheppard with Yonge a huge money pit. Steve does not have an “issue” with it, but like myself, we are aware of the severe restrictions in the track work that would make this very problematic. - Relocate Oriole GO Stn such that it’s parallel to Leslie Stn. This would allot for a simple transfer between commuter-rail and subway. That this hasn’t happened yet should infer to us all that our transit-employed contractors can’t keep to a time-limited schedule; so imagine the many years Yonge St motorists and pedestrians and property owners would encounter disruption were they to tear up that corridor for excavation. I don’t understand why this connection is still not there. Oriole is one GO station that has what I call a “good parking lot” in that it makes use of space under the 401 overpass. The entrance to the station is there and the platform extends to the south. Why not leave the station entrance where it is (it could be shifted a little to the north and still be attached to the parking lot), but have the platform extend to the north where its north end would be able to have the connection with the Leslie subway station that is long overdue? - Reserved bus lanes through Thornhill’s Yonge St for VIVA buses. This will offer better local accessibility than the subway would as it’d make five stops en route opposed to the subway’s 3 and would allow same-level accessibility for seniors and those whom would have difficulty climbing/descending stairs. - All the 300-Series express bus routes to Finch GO Terminal from Beaver Creek/Markham could utilize private, reserved BRT lanes through the Finch Hydro Corridor. These services could seamlessly link to Seneca College and Old Cummer GO en route. - Markham residents would benefit far more from having the “Don Mills” LRT extend into York Region and run parallel to Hwy 7 between Doncrest and Markville. This links all the major commercial, civic and business centres of that city- Beaver Creek, Markham Town Ctr, Unionville- and the Centennial GO Stn. Were this a grade-separated operation, not at the mercy of local traffic signals, the quality of service could be in the realm of subway operation (2 1/2 minute headways). - Toronto itself could operate a Crosstown BRT route through the Finch Hydro Corridor continuously from Weston Rd to Warden. To the west, Finch Ave is wide enough to accomodate reserved BRT lanes in leiu of the LRT line at a fraction of the costs. This could run past Humber College to serve points down the 4/27 corridor~ Woodbine Ctr; Woodbine Racetrack; Dixon Rd- transfer to Eglinton/DRL line; Burnhamthrope (ECC/Vahalla Corporate Ctr); Dundas (Cloverdale Mall); and Sherway Gdns- transfer to B-D Line extension. - East of Warden, the Finch Crosstown line could route past Bridletowne down to Sheppard Ave through Agincourt; then along private ROW adjacent the Midtown sub to Malvern Town Ctr. Here it could meet with the SRT line. - And I’ve already explained in the Don Mills thread how a 42-km long continuous Jane-Eglinton-Don Mills LRT line in exclusive ROW and a 42-km long DRL subway line from Pearson Int’l Airport to Scarborough Ctr (with BRT for everywhere else) may very well be a better utilization of the Transit City funding than what is being undertaken, which IMO is not in the transit using public’s best interest. See, these are projects the TTC/Metrolinx COULD have been recommending instead of jumping the gun by prioritizing subways where LRT hasn’t even been attempted yet and in turn place LRTs where BRT has never gone. Both the original Bloor and Yonge Lines were overcapacitated streetcar routes before subways were ever thought of to handle loads. It’s this mentality that anything less than subways for York Region is inferior and ergo challenges their status quo, that’s dooming our entire urban region to transit ruin because the most costly of higher-order metros are being prioritized for the wrong lower-density, lower trip-generating corridors and areas; meanwhile the densely populated, skyscrapered and multiple points-of-interest enriched downtown cores of Mississauga, Toronto and Scarborough continue to go without any new E-W subways. Ridiculous! It is going to take the first LRT line to prove to the public that this is a viable option that fits in a space between buses and subways. I am hoping that the TTC does not screw it up. At least the Sheppard line will be the first in operation. Though a line like Eglinton is probably needed more, Sheppard has the best chance of selling the public on LRT as it is least likely to “take anything away” while adding improvements. Maybe one it is in operation, people will realize that subway should only be considered for where other options just do not fit the bill. I wish I could share in your enthusiasm over the Sheppard East LRT line, but pushing this LRT first of all the Transit City lines appears to be more of political motivation (i.e. a deathknell to any further subway expansion along Sheppard East) rather than something being built with the public’s best interest at heart. While I personally do not think it necessary to extend this subway, the option of expansion should be left open-ended for future generations to decide whether it should be a priority for them. It’s especially aggrivating to think of considering the overbuilt mezzanine level at Don Mills Stn which could more than accomodate a through Finch West-Sheppard East Line one above subway platform level. Surely such a configuration would cost less than $130 million and not have to involve tunneling underneath the 404 (a private LRT bridge could more than suffice). In reality, it’s a lot simpler to descend one flight of stairs/escalator to one’s connecting train than it is to walk 50+ metres from where the LRTs are proposed to dock (in a station that’s a continuance of the subway’s platform level and not parallel to it). But alas this is more evident of the “most expensive option” planning method that I was alluding to above. Cal’s comment: I can’t argue that there are no political reasons behind any decision that the city makes, especially in a city where your permission to cut down a tree depends on who your councillor is. Even so, the existence of political reasons do not in and of themselves negate any actual benefits that may exist. As for the issue of the connection at Don Mills being at subway or mezzanine level, cost is a bit of a red herring as either level will cost about the same. This is still being looked into since the idea of bringing it to the subway level was being seriously looked at before the premier sprang the idea of bringing the Finch LRT east of Yonge in the funding announcement. Either approach will require the tunnel under the 404, or bridge construction costing about the same since just adding a “private LRT bridge” is not such a trivial matter as it will require reconstruction of the existing bridges as they will have to be separated for the “private LRT bridge” in its median. But back to Richmond Hill. If area residents had to choose between spending 45 minutes on a cramped multiple-stopping YUS subway car to the Toronto’s Central Business District or 20 minutes on a spacious limited-stopping GO regional rail express service (REX) with fare integration or at least fare subsidy, which would the public prefer? The only obstacle I see in the way of this happening is the case for people desiring points off Yonge prior to Union. This is why I the Sheppard-YUS interline is so appealing. To clarify cause I don’t think I explained properly how this interline would work exactly. I’m not at all suggesting we re-excavate Sheppard-Yonge, build a new interchange station or anything of that nature. The Sheppard tracks end at Bangor Rd, 2 blocks west of Yonge St. Were the excavation to continue another block over Pewter Rd and then veer down this street, the path back onto the Yonge subway alignment would be quite achievable. This is due to Pewter ending abruptly in parklands only 5 mini blocks south of Sheppard. This greenspace curves at an angle towards Hwy 401/Yonge where the rejoining with YUS would occur. I know it’d be expensive to implement, but such an undertaking would enhance the quality of the service overall by sparing ‘through’ customers from an unnecessary transfer point. I find it odd that this idea is being suggested when a $130 million tunnelling above is considered “most expensive option”. Setting aside the cost of this suggestion, consider some of the technical issues in the way. The most notable is the idea that a subway line can “continue another block over to Pewter and veer down this street”. A subway train is not a 40-foot bus and cannot simply “veer down such a street”. If the line were to be tunnelled under homes with the curve starting at Bangor Road, it would reach the Pewter alignment about 50 metres south of Poyntz Avenue. That would make for a curve with a 150 metre radius. That curve is tighter than the one between King and Union! Even if you could get support of people in the area for tunnelling under their homes and putting in a curve with all its screeching, this alignment is likely to cost upwards of a half billion dollars. I really wish I could get some criticism from you regarding my last bullet point above though. I feel as though Eglinton has long-term potential as a subway line in spite of today’s growth projections. This expectancy can only grow were the Eglinton Line composite of a greater subway network spanning the whole city. This is why, instead of having both legs of the DRL become pigeonholed at Mt Dennis and OSC, I’d recommend extending the line both ways across Eglinton and up arterials to the major trip generators/transit hubs Pearson Int’l Airport and Scarborough Centre. I figure the best way to kill many transit priority birds with one stone is to have the one continuous line acting as a back-up and major alleviator to both the YUS and B-D subway lines. I think the days of subways (or LRTs for that matter) rigidly following along a single arterial even through low-density sprawl are long behind us. A subway with the mutability to service several marquee nodal zones and major intersections is the best bang for buck. And even though GO has a role to play, there’ll always be UGCs nowhere near the existing railways, where mass transit has to penetrate. So in conclusion, wouldn’t 2 significant U-shaped higher-orders: the DRL as outlined here and a continuous Jane-Eglinton-Don Mills LRT line in exclusive ROW with dedicated BRT corridors interspersingly filling the gaps elsewhere not be a better usage of Toronto’s share of MoveOntario2020 funding than what we’re witnessing right now? The fact alone that LRT can penetrate further into York Region from a cost perspective than subways can should also be of interest up there as well, way ahead of of extending YUS on either leg to Hwy 7, in my opinion. I’m not convinced that U-shaped lines are the most efficient use of rapid transit infrastructure. Imagine if the Yonge line was left to end at Union and a University was built as a new line that ended at Union one level below (or to one side on the same level, if there were space). No one would ever think at the time to build it this way, but let me go on… A Yonge line extension could continue west and a University line extension could continue east. Very few people really need through a through ride - most who do so now only do so because it is possible. Separate lines mean that a problem on one does not delay service on the other. In Buenos Aires, they have four radial subway lines converging on the downtown area with a fifth line connecting them (as they don’t converge at one central point). This is not all that different from what we have in Toronto, except that each pair of radial lines connect with each other. The vast majority of riders do not ride through, but have to put up with service disruptions on another “branch” disrupting their travel. Based on some of the feedback I’ve been receiving here and over at Steve’s blog I’ve decided to publish a map outlining my own version of Transit City. Particularly of interest to me was how to bring mass transit to Richmond Hill Centre without dredging up the Yonge Street corridor north of Steeles, an act too grossly expensive and unwarranted to even fathom at times. 1. Use the same TBM that’ll bore the subway tunnel to Steeles to continue excavation up til the York Sub. Ventilation fans within tunnel. 2. At York Sub have a station at track level with long escalators transporting customers to/from Glen Cameron/Yonge just south of Clark. 3. The rest of line I’m proposing could utilze low-floor DMU trainsets meaning it could run along the same trackbeds as freighters do without much in the way of new track installation (apart from passing tracks at the outdoor stations). 4. Have another stop at John/Bayview (Thornhill Square). Basic stn design. 5. RHC station would be parallel to the GO line but functionally act the same as the subway would as headways could be near its frequency (i.e. every 2 ½ minutes/ RHC - Steeles subway = 8 mins when operating at speeds of up to 80km per hour). I’m hoping that a ‘no-frills’ approach to transit building, will stretch the transit funding budget a bit further, taking into account bringing mass transit to some key trip-generators somewhat overlooked by the official Transit City proposed lines. In doing so I’m quickly finding BRT to be desirable in areas such as the Finch Hydro Corridor and along Kingston Road even northeast of Eglinton. That’s not to say light-rail doesn’t have its place, but I believe a healthy balance of BRT, LRT and one major new subway line linking the airport to the downtown core/ CBD and there to Scarborough Town Centre is what’s urgently needed for Toronto to truly have a transit network. 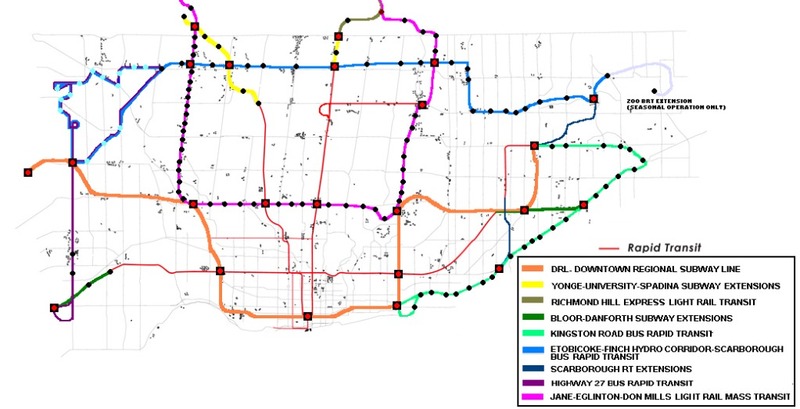 So without further a do I present to you, Jerome Johnson’s Rapid Transit Solution for the City of Toronto (and to some extent for York Region). I appreciate any and all criticisms. Cal’s comment: Have you come up with a cost estimate of this plan? I’m not so sure that this plan is as ‘no-frills’ as you would like to believe. Even using existing rail lines for DMU operations as you suggest for service to Richmond Hill will not be just the cost of ‘passing tracks at the outdoor stations’, but that is moot if regulatory reasons keep this impossible to implement. BRT has its place in some situations, but one must seriously take into consideration howm much higher it costs to operate compared to LRT, especially considering some of the infrastructure needed for the Finch project.